The Nugget CSC is based on the Whip outline with some fundamental differences in aspect ratio and bottom shapes, optimized for light wind and small wave performance. The forward V blends into a deep double V bottom shape, fusing multiple contours that offer the perfect combination of early planing and glide with maximum agility for small wave performance. Increased rail rocker makes the Nugget CSC extremely maneuverable when put on the rail. The deep double concave adds grip and also channels water through the flat planing surfaces directly into the quad fins, offering superior lift for maximum light wind and upwind performance. This unique and modern design creates a board that is very stable at speed despite the width. 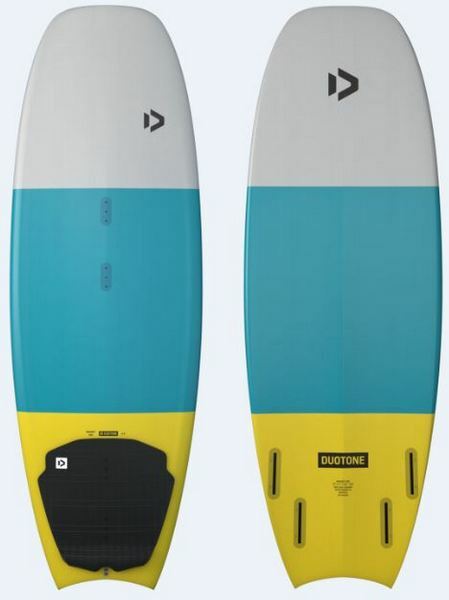 Built using the tough Bamboo Tec Construction, the Nugget CSC also has a subtle grab rail to aid with strapless tricks. If you want to have fun every time your feet touch the sand, no matter what the wind and waves are doing, the Nugget CSC will be your magic carpet ride. 5’3” x 21” x 2 5/8"
5’0” x 20 1/4" x 2 3/8"
All boards now come with our own Futures Fins compatible fin boxes. Two side set screws and no rear tab allow for a wider tolerance of fin fitting and ensure a perfect and tight fit every time whether you’re using our high-quality composite fins or any stock after market Futures brand fin. Easy to install and uninstall even with Sand and Salt.